Thanks, Cale! I just sent you a reply. Well, it happened to me today for the first time. My 2014 F-250 6.7 King Ranch with 22,000 miles started right up... I drove to our mailbox, set the parking brake and put it in park with the engine running. I got back into the truck, and hell's bells, I was blitzed with ominous warnings on the dash: Low Oil Pressure; Engine Overheating; Service AccuTrac (I think that's what it was called). Since it was still running, I put it in drive and went down the street, thinking it might clear all the warnings once underway again. After two blocks, everything was still warning on the dash, so I stopped and shut her down. I then turned the key to re-start the engine, but it will not crank at all. The dash lights up, radio works, etc. but there are all the warning icons lit up. I am waiting for AAA to tow the car to Sonora Ford where I bought it 2.5 years ago. Thank God it's still under warranty. To have a very youthful vehicle "strand me" (albeit close to my home) is a real confidence breaker for me. I have read the many posts from others here with similar problems... who've made multiple trips to the dealer but still experience intermittent malfunctions. Chafed wires, E-brake issues, computer replacements, CAN bus swaps, harnesses.... these are serious dealer-only problems that I had not planned on confronting when I shelled out over $60k for the King Ranch. Can bus is going down. Wires are in the harness mounted near the park brake. 2015 F350 (mine) has markings indicating they are double checking the mounting of this harness at the factory. My truck is doing the same no start and warning messages, the harness is not in its correct mounting and is rubbing on the park brake assembly. I moved the harness and secured with a wire tie. Fixed. 2013 F350 6.7. 112,000 miles. Mini Max Tuner with full delete kit. Driving down the road the gauges will turn off and back on. The a/c will turn on and off or lower then raise the fan speed. Radio will go off and you hear a loud bumping sound in the speakers then comes back on. Brake warning light goes on and off. Truck runs fine when this happens. I have went under the truck moved all the harnesses. Under the dash and even completely disconnected the batteries for 30 min. throwing codes PO625 AND P054F. I clear them and less than and hour later they come back. Check engine light comes on and goes off as well as the battery light. Any Ideas? I realize this is an old thread, but..... I am having the SAME issue with my 2013 F350. The dealer is not seeing any codes and at this point I feel like it is a SAFETY issue as all the dash lights/gauges shut down (and at night I can't see anything). At one point I had to have the truck towed to the dealer as the truck would not start. So frustrating - I really want to go back to loving my truck. I had a 5 yr warranty and last summer purchased and extended 3 yr warranty. My last F350 went 10yrs.....5 yrs seems unacceptable. Have folks found that the primary cause is the wiring/harness by the e brake? Any other solutions out there that have proven to work? I find it impossible to believe that there are no codes in any of the modules. Assuming your concern is a network fault and it certainly sounds like it there should be a plethora of network/communication codes found in multiple modules. I wish y'all would stop fixating on the connector above the parking brake ratchet - it is the least common point of failure that I have seen. Keep in mind that this is one of the more complex diagnosis a tech could face and having the fault present in the service bay is almost essential... unless you know where to look. The warning lights went off about 20 times today on my ride into work (this time - primarily "service Advance Trac and the Wrench" - including several dahsboard shutdowns. Needless to say the truck is back at the dealer. I find it surprising as well that no codes are generated. Check the wiring harness under the driver's side foot well!!!!! I am dealing with the same issue plus an airbag deployment while parked. The dealership was not very friendly on my first visit. We will see how things go now that I have found the problem or will they push my airbag deployment button. Ford time to put out a warning to your owners about a potential issue. I can't get the photos to post but anyone that would like the pictures I would be happy to share them with you. At this point I have found 12 wires compromised in the harness under the foot well, one of which appears to be the same color code for the airbag circuit... This is the same issue that plagued the F 150's a few years ago. Off to the dealer I go....wish me luck. Thanks Larry, it's been awhile for me to be thru here. Life has me busy....well till this fiasco about put us out of business. Well the word from the dealership is that the wiring harness wearing thru under the foot well is fair wear and tear and poses no hazard. They will not repair it!!! as the truck is no longer under warranty. The last truck they did was under warranty and took 6 months to repair. They had to send all the control modules in to be tested and that took over a month to get them back. So I guess that will lead me to work this thru Gov't channels citing the potential of an injury/death hazard. Why does this have to be so difficult when the problem is so obvious? Wearing thru a wiring harness in 18 months that we have owned the truck is not a fair wear and tear issue. That is a manufacturing defect!!! by not providing amply space or proper covering for the wiring thru a high traffic area...ie the door that you get in and out from driving your daily driver!!!!!! Well the word from the dealership is that the wiring harness wearing thru under the foot well is fair wear and tear and poses no hazard. They will not repair it!!! as the truck is no longer under warranty. The last truck they did was under warranty and took 6 months to repair. They had to send all the control modules in to be tested and that took over a month to get them back. I call bullshyt. That harness is in a recessed area and is covered completely by plastic trim. Unless that trim is damaged or missing it is protective in nature. As for sending modules out to be tested, we simply do not do that. We replace modules, we do not repair them with the exception of select old, obsolete modules, radios and the odd instrument cluster. Network diagnosis involving suspect modules involves simply disconnecting them while monitoring the network with an oscilloscope or an ohm meter as applicable. Obvious harness concerns are easily repaired - I do it all the time and so do most of my peers. As for damage of the body harness under the sill plates, there are just a few really common concerns. Most notably, splices where circuits split and have multiple wires coming out of either end of the shrink tubing tend to not seal properly. Any moisture that gets to these splices that are not fully sealed WILL get in there. The sills are the lowest point in the floor where water leaks, excessive snow and ice on boots that melts carrying ice melting salt for example is a common occurrence. In many construction and landscaping trucks for example, it is common to find dirt packed into there which not only becomes abrasive if there is any movement of the wires but also holds in the moisture. I cannot tell you how many times I have repaired rotted out splices on Super Duties in the last 10 years. Guess what the most common system is affected? Yep. Networks. Second, Power Locks and Windows. Both have splices in those areas. If the harness is damaged the reason is usually obvious: an upfitter put a screw through the harness, bad repairs and unprotected areas such as I mentioned. larrgh, gearhead1011 and Phillippeterson like this. Last edited by ford_doctor; 02-13-2019 at 11:50 AM. I am the one working on it...I cannot have a business truck down for 6 months while they do exploratory surgery to find the issue. I am glad I did take on the work versus letting them hack thru it after service writer told me about the last truck they did. Doc it was the last place I was expecting to find damaged wires. AS I would also have to agree with you but I am here to tell you in total, partial because of the short that seems to have taken place, I repaired 8 different wires that were charred and or broken. 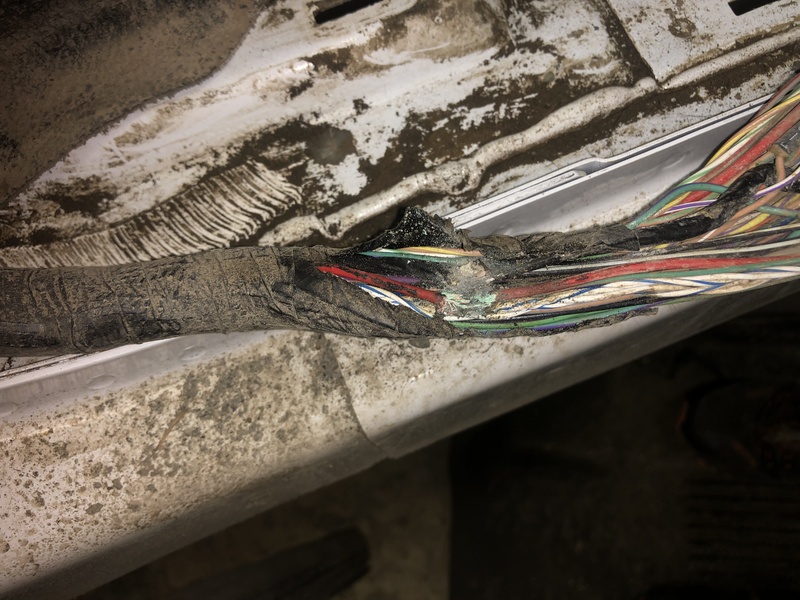 I also believe some of the issue comes from the amount of debris that seems to be in that channel from road debris/normal boot tracking, but the problem was at the top of the bundle where it seems to have wore from the sill. Plus they are using alot of salt brine on the roads this year, so did find a high number of salt crystals in the channel as well. Now I will say that these are delivery vehicles and the drivers get out between 10 to 15 times a day, 5 days a week so a bit higher traffic then average. So last part of the story upon inspection of 5 other Superduties in fleet I have found one other that is also developing the chaff. I found no splices in any of the channels. I got 2 photos to load...those are just like I found it under the door sill. I have more if you would like to see them. Last edited by Big Boy w/ Big Toys; 02-17-2019 at 11:18 PM. EXCELLENT FIND! That is what I am talking about. 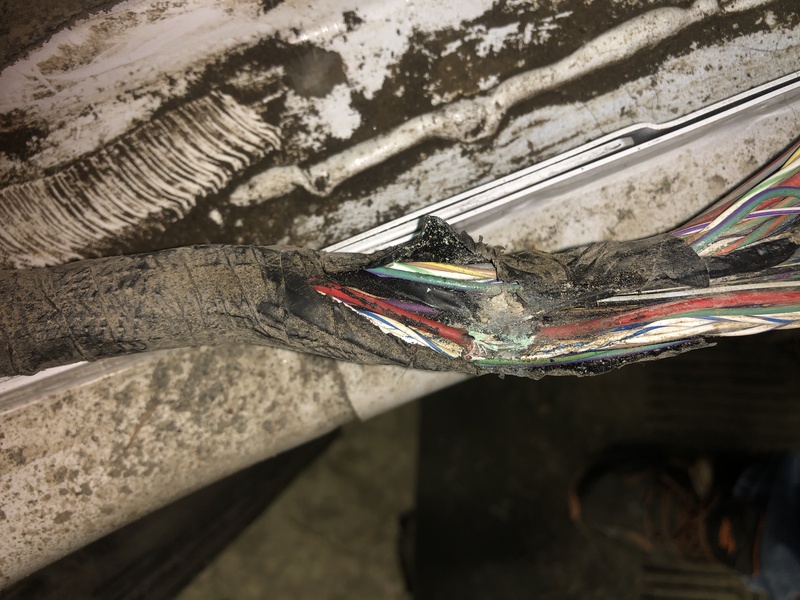 There are indeed splices in that harness - I can see the network wires in the picture you posted... you would have to remove more of the tape to find them though. Without a doubt fix the damage you found and reevaluate. To "fix" that use extra tape and place a section of plastic wire loom over the affected area.